NTR-Pooja Hegde starrer Aravindha Sametha Veera Raghava is being made under the direction of Trivikram Srinivas. The latest poster of NTR's Arqavinda Sametha Veera Raghava unveiled. The audio of this action entertainer is to be out soon. The makers of NTR-Pooja Hegde starrer Aravindha Sametha Veera Raghava have made an announcement regarding a surprise related to the movie. 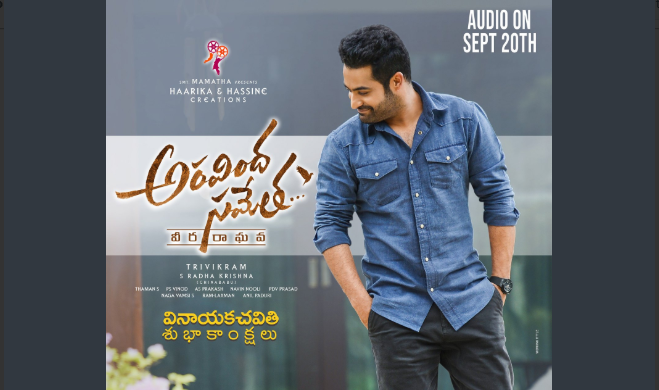 The latest poster featuring NTR from the movie was unveiled by the makers of Aravindha Sametha Veera Raghava. The poster is made with Vinayaka Chavithi wishes and an important announcement was made. The audio of the movie is to be out on 20th September, as per the announcement made by the makers. NTR looks super cool in the poster which was unveiled a while ago. More details regarding the audio release are awaited. "On the eve of Vinayaka Chavithi, Here's a rocking New Poster of Young Tiger #NTR @tarak9999. The Audio Album will be out on September 20th. A @MusicThaman Musical! There will be more updates coming this week! Keep watching this space #AravindhaSametha A #Trivikram's Celluloid", the makers announced via Twitter. After the hit movie Jai Lava Kusa, Tarak had taken a brief gap before he got roped in for the movie titled Aravindha Sametha Veera Raghava. This movie is touted to be a Rayalaseema-based action entertainer. Directed by sensational director Trivikram Srinivas, there are huge speculations regarding the movie. It is for the first time that NTR and Trivikram are collaborating to work together. Pooja Hegde, the current sensation of Tollywood has been roped in, to star opposite Tarak in this action entertainer. NTR is to be seen in a chiseled body and it is touted that he is to speak in a typical slang denoting the 'Rayalaseema' dialect of Telugu. SS Thaman is to compose the music for this movie. Adarsh Balakrishna, Naga Babu, Jagapathi Babu, and other actors will be playing significant roles in Aravinda Sametha Veera Raghava. The teaser which was unveiled earlier got a decent response from the viewers. Bankrolled under Haarika & Haasinee Creations, Aravindha Sametha Veera Raghava is being produced by S Radha Krishna. The movie is expected to hit the screens during Dussehra.